This REL Northwest publication summarizes the experience and recommendations of EWS users throughout the United States. 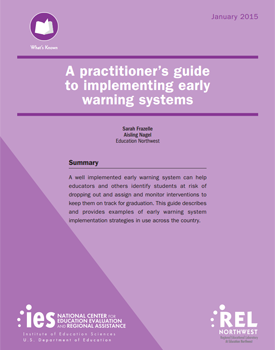 The guide covers how to establish and train a team to use the EWS; identify accurate indicators; develop usable indicator reports; map interventions in response to student needs; and evaluate student progress. This guide was published by the Institute of Education Sciences (IES) in January 2015.